Company apparel – and the desire to wear it – has come such a long way. Long gone are the days of boxy, thick, white t-shirts and bunchy button-downs. Many businesses have scaled down their dress codes significantly, especially when comparing the way women dressed in the twentieth century. Now, so much a part of company culture is the desire – and the interest – to wear corporate branded apparel not just to support and promote the business, but also because it fits well. It’s moisture-wicking and cut just right. Teams get together to take selfies and voluntarily share them on social media. Companies offer apparel to their employees to purchase at a discount, and they gladly do. The change from then to now is remarkable and gives us an opportunity to hone in on how we can use this exposure to build up a brand. 1) Promote a sense of unity. Branded apparel – worn at every level – sends a message that everyone’s contribution is valuable. 3) Help guide the tone for the dress code: Dress codes can be complicated. As an employer, when you provide a “uniform,” you have just simplified your company’s dress code – that’s one less detail to worry about on how your business can succeed. 4) Logoed teamwear is cost effective. The benefits of branded apparel find their roots in the benefits of promotional products in general. More exposure! The number of impressions you get from each shirt makes apparel the best form of advertising that you can purchase. 5) Create some brand buzz. Have you ever heard the business expression, “word of mouth is like gold?” It is! There is no better way to sell your business than by your employees’ recommendation. It shows they have pride in their company. When team members take pride in their employers, they often share it with others. By wearing logoed shirts, hats or other items, employees will carry your brand out of the office and into their communities without saying a word. With this in mind, we teamed up with our apparel experts to find a buzz-worthy shirt to feature this month. Being that polo shirts are timeless, in comes our PUMA Essential Polo Shirt. PUMA® is one of the world’s leading brands and grounded in four values: brave, confident, determined and joyful… to motivate people beyond their potential. Wrinkle-resistant and not too tight, not too loose, this polo shirt is great for work or play. It is made from 3.8-ounce, 100% polyester pique knit with a moisture wicking finish. It has UV protection and dryCELL moisture-wicking properties, drawing away sweat and keeping you dry and comfortable. The PUMA Essential Polo has all the right components: two-button placket with contrasting buttons, shaped seams and tapered waist for a flattering fit. In addition to its essentials, the polo is available in six stunning colors. PUMA® promotional apparel offers a wide range of options to accurately reflect your business and make people take notice. Its usefulness makes it a popular and effective choice for building your brand. Remember, if you can wear it, you can brand it and advertise with style. 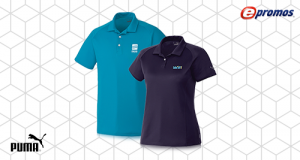 Call us, your Promo Know-How People, to talk through how to incorporate these great polo shirts into your marketing plan.